Hump molds are a great way to easily make a wide variety of pottery pieces, from ceramic bowls and cups to platters, vases and more. Hump molds are also called drape molds, because you drape the clay over the mold to produce the pottery. Use your favorite clay body with hump molds: earthenware, stoneware, or porcelain. You can hump mold a pottery piece using several different techniques, including coiling and slabs. Hump molds are incredibly versatile for making many pottery pieces with similar shapes, as well as for building original shapes. It's also simple to build stacking bowls or plates with the same drape mold. Because plaster draws the water out of the clay, you can quickly make pottery with hump molds, which makes them ideal for pottery classes where time is limited, as well for home projects. As soon as the clay firms up - sometimes in as little as a few minutes! - remove it from the mold, and start the next! How Durable are Plaster Molds? 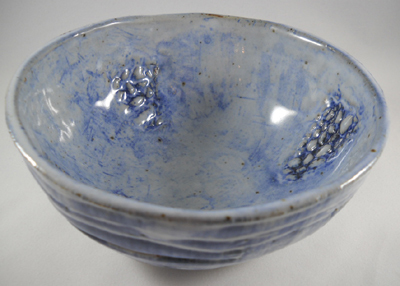 Made from liquid plaster, which is a combination of gypsum mixed with water, a given plaster mold can often be used to make many pottery pieces. 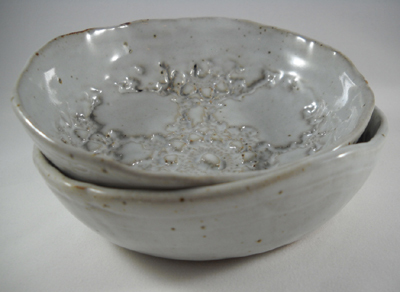 However, because plaster molds can chip or wear out, especially in a pottery studio environment where many ceramacists are using the same molds, they should be handled and stored carefully. Plaster scratches, and those scratch marks will transfer to the clay. If trimming the clay while on the mold, avoid contact with the plaster surface, especially when using metal tools. A scratch (or chip) in the plaster results in a raised piece of clay on your piece; Therefore, once the piece has firmed up and is off the mold, a smooth out tool or damp sponge can remove the markings from the piece. All hump molds made using U.S. Gypsum Pottery Plaster. Check back often as we expand our selection of drape molds! Whether you're new to pottery or an experienced clay artist, molds are an excellent starting point for beautiful and unique handmade pottery. 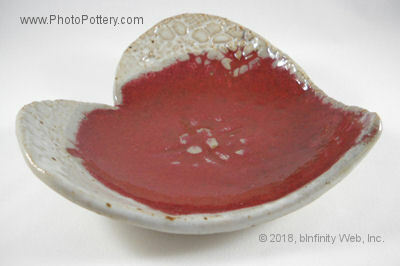 The heart shaped plate below was made on a hump mold. After rolling out the clay and adding texture, a heart shape was cut out. It was then draped over a bowl-shaped plaster mold.